If you follow my blog, or have browsed through my galleries, you know that I am a color photographer through and through. Lately, however, I’ve been experimenting and having fun with some black & white conversions, and thought I’d go ahead and launch a gallery of black and white mountain photos on my site! Some of these photos are exclusive to this gallery; others are conversions of color photos that already exist in other galleries. I intend to add more photos down the line, but for now it’s a start. Enjoy! Posted in Miscellaneous on June 29, 2012 May 19, 2013 by Jack Brauer. ← Previous: "Starry Night in Ouray"
Jack – love the gallery. I know it’s simple and cliche, but in my processing I’ve started to convert more to B&W by thinking “does color do anything for this image”? Unless it adds something substantial I’ve found convering to B&W really brings out the textures and shapes in the scene. It might not be as realstic a vision of what I saw, but I’ve found it to be a better vision of what I experienced. Thanks Erik! Yeah that’s one way to think about it. There are some scenes that don’t work well at all in color, but are great in black & white, like the Peruvian shot above, which I knew would be b/w at the time I shot it in the daylight. Many of my photos don’t work well for b/w conversions, because they tend to be very color dependent, with the soft even light that I would go for especially when I shot with color film. Spectacular! Abviously your color images are amazing, but adding this dimension is fabulous. Looking forward to seeing more. Great collection Jack! Like you, I’ve always tended to think of myself as a color guy, and so far have deliberately limited my options by not considering B&W. But maybe someday…. 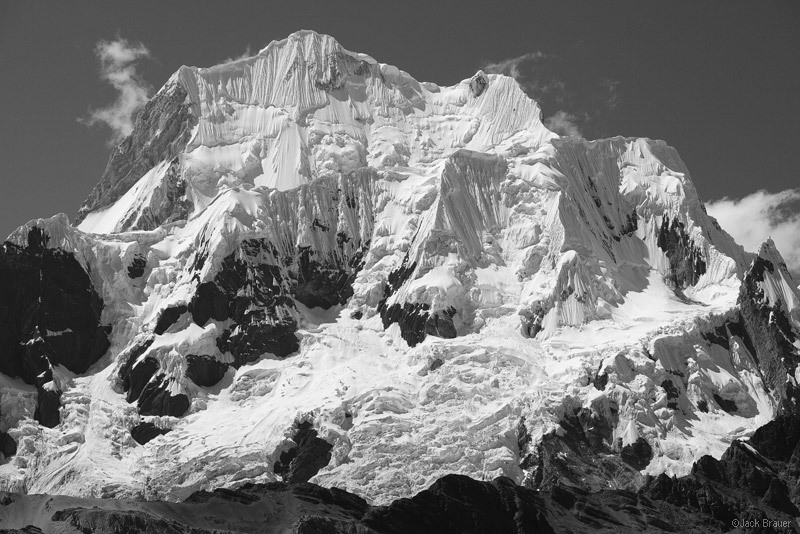 Anyway, the Peruvian shots are the real standouts here (love that snow fluting! ), plus Trollvegen and Misty Teton. Thanks Jackson! Yeah, I’m the same way… so far I haven’t wanted to “pollute” my collection of color photos with b/w ones, and I’m still keeping them in a separate gallery. Anyhow, a lot of people have been asking me for b/w photos lately, and it has pushed me to offer these ones as prints. The b/w prints have such a different style and effect in a room! I love your color photos but the B&W versions definitely add a different atmosphere to them.